Quackenbush Air Guns 9:00 am. to 6:00 p.m., Central time. NO SUNDAY CALLS! I am currently working on .575 cal air pistols. Check the Currently Available page for availability. For those on the list please read Paying for your rifle. Once a person gets their name on the list, it usually takes about 6-8 weeks for the first rifles to be delivered. The last of the rifles should be delivered in 6 to 8 months, so you may not get your rifle in time for hunting season. How the list works: When the gun style that a person on the list has ordered is ready, I call them and we make the deal. I don’t take deposits or any money up front. Upon receiving your check, I send you the ownership agreement. That lets you know that I received your check. The ownership agreement has hunter safety practices on one side & gun handling safety rules on the other side. Sign it & return it to me. What you're telling me that you know what you're doing. There are no numbers for the list. There’s no numerical sequence because not all styles of rifles are available in the sequence of the people on the list. For example, if the next 3 rifles I have made are standard grade, but the next 3 people on the list want a grade other than a standard, I will call those people wanting a standard grade. 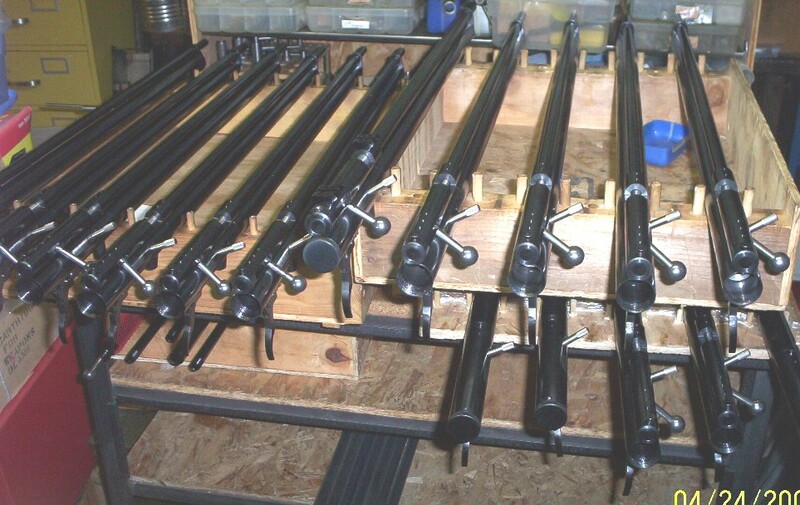 The #1 reason for having a list is that right now the demand for my airguns is greater than the supply. So for now one benefit of having a list is so that I know in advance how many parts for each caliber rifle to I have to make. This speeds up production time. These are the laws by which I must abide. No exceptions to the law. It is the buyer’s responsibility to know your local, state & federal laws, concerning big bore airguns, before you order. Failure to do so could result in your breaking the law. You must be over 18 years old to purchase a big bore airgun. Morton Grove IL, Chicago IL, Johnson City TN, San Francisco CA, Philadelphia PA, Washington DC, Buffalo NY, New York City and its boroughs (Brooklyn, Bronx, Manhattan, Queens, Staten Island). Illinois residents need a valid FOID card to purchase an airgun. licensed gun shop to ship a gun to. I do not ship airguns to other countries, including Canada. I will only ship to U.S. zip codes. Pictured on the left are rifles that were shipped recently. While in the rack, the stocks are protected by plastic tubing. The yellow flag at the muzzle is the customer's name. 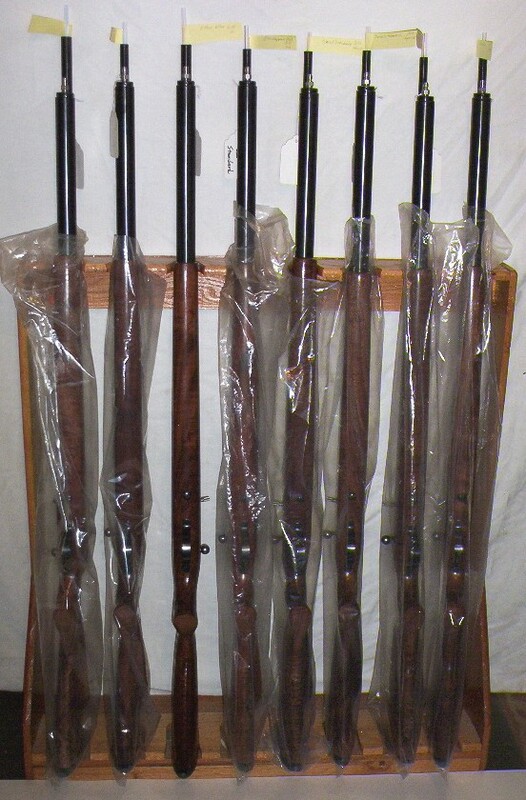 On the right are rifle actions awaiting stocks. I have been offered more money, than the regular price, to sell a gun to a person that's not on the list waiting for one. I turn them down. Nobody has been passed over and nobody has had a gun sold out from underneath them. And I have never offered somebody a substitute for what they ordered, such as a "personal gun". If you have time to build a personal gun, you have time to build a customer's gun.